The 2005 New Orleans Saints season was the franchise's 39th season in the National Football League. The season began with the team trying to improve from their 8–8 record from 2004. 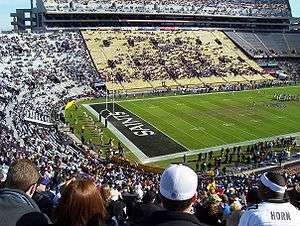 The Saints played two preseason games in the Louisiana Superdome before being forced to evacuate New Orleans due to Hurricane Katrina. They were forced to play the rest of the season on the road, splitting their games between their temporary headquarters at San Antonio's Alamodome, and LSU's Tiger Stadium in Baton Rouge, and even playing their first home game at Giants Stadium. The season ended with a 3-13 record, failing to imporve on their 8-8 record from last season, and the firing of Jim Haslett. He was replaced by current head coach Sean Payton the following 2006 season. ↑ "2005 New Orleans Saints Draftees". Pro-Football-Reference.com. Retrieved January 5, 2014.